Government and Taxes: Migration 23: Why Do Many Filipinos Work Abroad? Still here in Kathmandu, Nepal. I was asked two times by two friends that question, why do so many Filipinos work abroad? Good question and they are referring to the estimated 10 million Filipinos who work and study abroad, including their dependents. Yes, the 10 M includes children and dependents, university students, they are not all workers and managers as often implied by many articles. The National Statistics Office (NSO) data says that there are only 2.3 million OFWs in 2013. 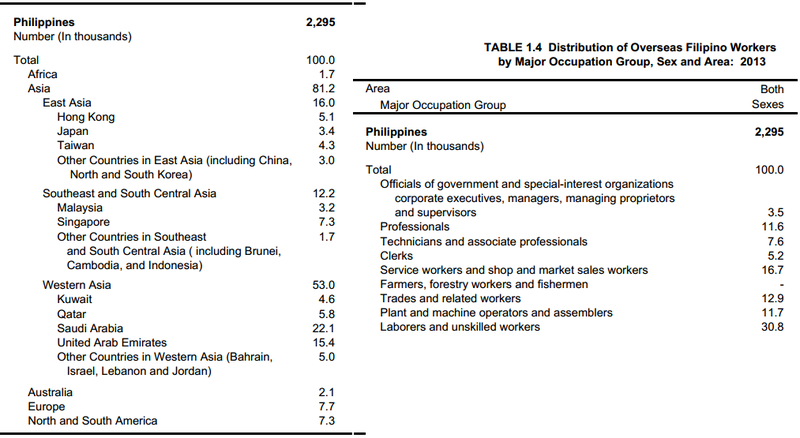 First table below, Distribution of OFWs by Place of Work, 2013. The quick answer to the above question I think, is that the phenomenon is both supply push and demand pull. Supply push, many Filipinos want to try working and living abroad for higher pay, have a new environment, join other family members, relatives or friends who are already there, accompany some kids who study abroad, and so on. Demand pull, many foreigners want overseas Filipino workers (OFWs) than other workers from other countries. Three examples. One, Filipino healthcare professionals like nurses and physicians are generally known to be more warm in taking care of their patients, so hospitals in Saudi Arabia, UK, US, etc. prefer Filipino health workers. Two, many Filipinos can speak and understand English is another important factor, easily trainable. And three, many maritime companies like cargo ships, cruise ships, want Filipinos because they are more used to riding or navigating boats. We are an archipelago of 7,100+ islands and islets, so for many Filipinos to move from one island to another, riding boats, small or big, is a common experience. A common follow up question is, Is the Philippine government producing policies that encourage more Filipinos to work and live abroad? I think the reverse is true, that certain government policies do not encourage but actually limit or restrict the potentials of migration of more Filipinos. Two examples. One, the mandatory trainings and seminars by TESDA, a government training agency and sometimes long waiting period to get training schedule; seminars by POEA and OWWA, the government deployment and welfare agencies, a then waiting period after finishing the training and actual deployment, And two, the PH government imposes certain rulings like in HK, OFWs in household work should get this much as minimum wage there, and so on. Some HK employers say they already paid a lot to the HK and PH manpower agencies, they give decent room to their helpers, etc. So giving a mandatory high minimum wage is additional cost to them, so they stopped getting OFWs and got Indonesians, Vietnamese, or other nationals instead. Employment, whether local or international/migrant employment, is a private contract between the employers and the potential employees or workers. Governments should not intervene in the pricing of labor especially with foreign employers in foreign countries. Governments should focus on the enforcement of those contracts, that the provisions are implemented and violators, whether the employee or the employer, are sufficiently sanctioned or fined, for breaching the contract. Overall, I wish to see the full freedom of mobility of people across countries and continents, like more Filipinos moving into many countries abroad, temporarily or permanently; foreigners moving into the Philippines, whether temporarily or permanently. The only things or acts that should be limited and restricted, are acts of crime against persons, properties and liberties. Thus, no killing, no stealing, no abduction and trafficking of people, no destruction of private property, no unnecessary censorship. In short, no harming of other people. Whether they are in the Philippines or abroad, whether they are Filipinos or foreigners. Mahirap sa Pilipinas, maliit ang sweldo... lalo na sa probinsya! Para naman sa akin okay maging pinoy abroad as long as hindi magtatagal ng lagpas sampung taon.